What do you want most out of the Moodle course you’ve created for your students? You’re probably thinking of the outcomes – the success rate of your course in terms of your students’ grades. But you can’t simply create a course and expect students to engage with it and want to complete it to the best of their ability. You need to give them the incentive to want to complete your Moodle course, by making it look like a course they’d want to get a good grade for. A well thought out, visually interesting course will work wonders compared to a dry, purely functional one. Read on to find out how an engaging Moodle course can be created in just six steps. …from the start. The course logo will be the most looked-at element of the course. It’s what students will see first, and we all know making a great first impression really makes a difference. So give them something they’ll see and then want to explore! One of the easiest ways to create a good logo for your Moodle course is to arrange text and images in, say Google Slides. Make sure the main title of the course is prominent, give it a snappy, meaningful strapline – and then illustrate it with one (or maybe two) relevant images. Then, give each section of the course an exciting, engaging header. Maybe be use a theme for the headers – or, for example if it’s a history course, use famous quotes related to the subject! Be careful with the font you choose, too. Remember – nobody ever, ever takes Comic Sans seriously! No doubt you’ll already have a fantastic Moodle theme design (if not – speak to the Titus team) and this may determine how you want your course to look. 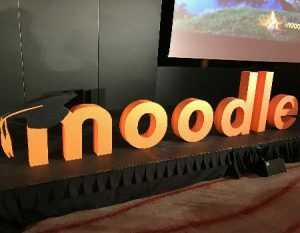 As a school, for example, you may have a bit of a style guide in terms of the layout of Moodle courses, to ensure they fit in with the ‘look’ of your Moodle. With regards detail, don’t fill the course with text and graphics when just a few will do. Using the Collapsed Topics feature will also keep things looking nice and neat – and easy to digest. Students are savvy: they’ll know when something is no longer in vogue – probably before you do. So, at the very least make sure you don’t use dated images or graphics that undermine your message, course topic – or your authority as an educator. Try and use subject matter they can relate to. Also, gamifying their learning makes for an engaging Moodle course. Include quizzes that allows them to compete against their peers and you’ll bring out their competitive streaks – and desire to succeed. We wrote this blog post about using gamification in learning last year. You may be keeping it tidy – but that doesn’t mean it can’t be interesting! For example, add an RSS feed to the side bar. You can use it to pull through headlines from your favourite news sources, or stories from magazine sites. It can be tailored to be relevant to the Moodle course you’re building, and with thousands of newsfeed options to choose from, you’re sure to find something. Additionally, an embedded Twitter feed can be used in the same way. Or, use Moodle’s random glossary block, which sits on the Moodle sidebar. Because this pulls content through randomly, every time the student loads the page, they’ll get something different. Don’t overdo the writing and the explanation. Sometimes, you can just let graphics and images do the talking. One way to keep your Moodle course visual and reduce the word count is to use infographics. An infographic gets across words, facts and figures in far more interesting ways than half a dozen paragraphs or more likely will. Do a quick Google Image search for infographics relating to your course subject. You’re bound to find some. If you don’t, though, and have a bit of time on your hands to really get creative, you can make your own. A great Moodle course really stands out when it has a bit of personality – your personality. And by keeping your course personal you can break down those formal barriers between teacher and student. Start by adding a welcome video. Even if it’s just a video on your phone – it doesn’t matter. Most phone cameras are pretty high quality these days, and uploading and embedding your video onto the Moodle course is simple. Put some of your excitement for the course topic not just into your video, but the language you use throughout the course too. Use your own personal touches – so your students know the course is coming from you. Finally, if any of your students ask you a question via email or private message about the course, ask them to post it to the forum – that way, if anyone else has the same question, you’ll only need to answer it once. If you need help with creating an engaging Moodle course using any of the techniques mentioned above, just get in touch with the Titus team here. Alternatively you can call us on 0113 3200 346 – we’ll be more than happy to help!